Jewish girl from Sinope in 19th century. Sinope was an Asian, Greek coastal town on the Black Sea. 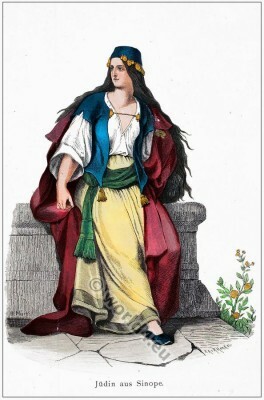 The illustration shows a young Jewish woman in traditional clothes around 1850. This entry was posted in 1850, 19th Century, Asia, Hairstyle, Headdresses, Traditional and tagged Jewish Clothing, Lipperheide on 6/2/13 by world4.